!!! Pocket Apocrypha Has Moved --- Click Here !!! I'm taking another break for a while. My anxiety isn't holding up well and I need to take some time for myself to recover. Frankly, modding can be a thankless job and some of the people one is forced to interact with can be... deeply unpleasant at best, to put it in the kindest way I can and not as I truly want to. For now, I feel like my mods don't need any further work done to them. They're fine as they are. See you later, folks. I'll be back! I'm not gone for good, I just need to set this aside for now. That's all. One thing I will say as a final note is that it'd be nice if one could turn off the comments system and only have a bug tracker in the vein of Nexus Mods. That'd be handy for people like myself who do deal with anxiety. And I deal with a lot of anxiety. See you around, folks. My thanks to those who were kind. Notice: Please download the addon from this location for now, and report back in the comments if you crash while trying to import from the lore library, thank you. Click here to check out my other addons. The Now Actually Working edition! Sorry about that. Wouldn't it be nice if you had a Lore Library, but for every book you encountered across your travels? Recorded, readable at any point, with a way to keep track of which books you have/haven't read, sortable by various factors (such as alphabetical, the time you found the book, et ceteara), and searchable for when you're seeking out that specific bit of lore? Welcome to Pocket Apocrypha, your own little slice of Hermorah's own realm right in your proverbial pocket! Now you don't have to stop to read every single book along the way, you can rest easy and trust that they're all being stored in your own little pocket realm to be retrieved later. This is a port of Librarian. For more information, see the FAQ below. In the hallowed words of our dear Commandant Lassard, Pocket Apocrypha can do many, many fine things for you. An incredibly safe database system which properly tracks books (including those with the same titles) via their IDs. That is a lot of things, isn't it? Well, it's all very friendly and easy to understand, as you can see from the screenshot. It also has a collection of utilities! Update -- For when the database needs to be updated (I'll let you know). There's an instructions file in the Utils folder to get you started in understanding what each utility does, along with detailed steps for their use. If you have any further ideas, let me know in the comments. Q: Why port? What's wrong with Librarian? book meidums has rendered Librarian broken, anyway, and databases ruined; I could point at how it has a number of existing bugs which I wanted to fix; I could also point at the new functionality and improved features of Pocket Apocrypha; I could... but none of those are the reason you should switch. If ZOS changes the contents of a book (typos, corrections, changes to the book medium, et cetera), those changes will never be incorporated back into Librarian. This is all fixed in Pocket Apocrypha. Every book you find will be stored by its unique book ID, so you won't encounter any of the above problems. 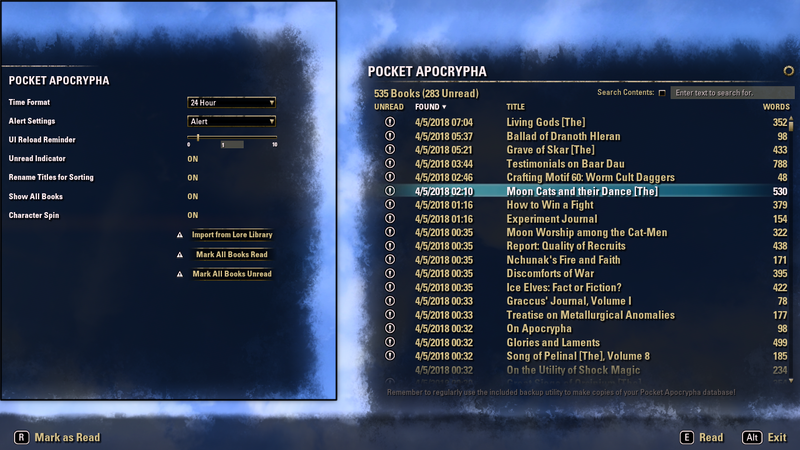 Furthermore, thanks to using IDs, Pocket Apocrypha will update your books as you find them in the world again to match any changes ZOS might've made. The release of Pocket Apocrypha was necessary. Not desirable, perhaps, but absolutely necessary. Q: I'm a user of the original Librarian addon. Can I use my old database with Pocket Apocrypha? A: No. I'm sorry. Due to the books being stored by title, there's absolutely no means to salvage that database. It's ruined. The sooner you start over, the better. I'm sorry to have to say it, but Librarian's database is simply that broken, you're better off going at it with a fresh start, knowing each book is stored by its ID and thus is future-proofed against any cataclysmic changes (like the ones that befell Librarian). Q: I used the builds of Librarian you released under the comments section, can I use that database? A: Yes. It will need to be converted but that database is 100 per cent compatible due to its use of book IDs. Use the database update utility to convert your old Librarian database over Pocket Apocrypha standards. Q: Will you setup a system where people can share their books so that we can all have a complete database? A: No. It'd be far too easy to inject nonsense into it as I have no means of verifying what is or is not a real book. So someone could include a book about penises, and if it were written well enough we'd be none the wiser that it wasn't in the game itself. This would lead to people talking about ESO having books about penises. That'd be bad for everyone involved. So, sadly, this can't happen. My ever patient beau who manages to sometimes raise my courage to the point where I can post things online. Fix: Book mediums being updated from CWC standard weren't properly storing their medium. Improvement: Changing character names in books that store character names would result in Pocket Apocrypha reporting an updated book whenever you found that on a different character. This is hardly ideal. Instead, PA now strips out the name when storing a new book and replaces it with a placeholder. When viewing the book, the placeholder is replaced with the name of the character viewing the book. I felt this was the most apt way to deal with this, and solves the problem. From now on, you should only see those books being updated once more (to get the name replaced with the placeholder), then you won't see that again. I noticed that the Clockwork City pro-grammatically changes the medium of its books, this is a problem since any books you already have will be updated to CWC standard when you view them there. I've included an option (which defaults to off) which doesn't update the medium for CWC books, it's off by default and it should stay that way unless a medium-related database corruption event has occurred. I moved the main files out of the root, leaving only the initialization txt there. This is just for cleanliness's sake. * Updated: Changed names of dropdowns to be more descriptive. Fix: Forgot to update locale files. * Update: PA now notifies you if ZOS has updated a book in any way, and there are now new options to handle how this notification occurs. If this isn't your first time using the addon, check those out and be sure to set them. * Fix: PA used to use the character time stamp for books even if the 'Show All Books' option was enabled, this has been fixed so that now the Universal time stamp is properly used. * Fix: PA would sometimes notify you of a new book if it was new for your character even when the 'Show All Books' option was toggled on, whereas with that option on it now only notifies you when you find a new book Universally regardless of character. o Added a version to the txt launcher. o Fixed issue where the keybind to open Librarian wouldn't work (SCENE_MANAGER typo). o Fixed issue where import would cause the import function to crash (RefreshData being called with every AddBook, it isn't doing that any more). o Fixed issue which would occur on trying to add a book (????) (not sure why this was happening but it appears to be fixed, too). o You can now right-click on a book in the list to mark it as read/unread. o Oops, forgot to remove an old Librarian test backup. Nothing sensitive in there other than character names; If you saw that... feel free to yell at me in-game, if you like! o Removed a couple of localisation lines I don't need any more. o First release. And it's size is the number of the beast. That's amazing. I'd just like to thank you for making your code available to us. Although I don't have the knowledge/skill required to put it to use, I'm sure that there are others who do. Making that available to use and learn from really helps us as a community. Cheers! The author of the addon made a deliberate decision to withdraw the addon from the world. Ignoring their wishes and republishing it would be ... well, the very best case is simply extremely rude, the worst case is breaking the law, and all. Building the UI isn't all that difficult either. I'd encourage you, instead, to focus on building a tool to replace this, rather than trying desperately to ignore the authors wishes. Even if you receive a copy via PM (hosting this anywhere would indeed be all kinds of problematic), what's the point? It's rather obvious that this addon won't be maintained any further. Looks like you'd be better off switching back to Librarian. There are updates for it in its comment section. Re: any way to get a working version of this? Thank You, yep was my mistake. Get this error after applying fix. Last edited by profcinders : 08/19/18 at 02:39 AM. Looks like they changed a variable name in the last ESO update. If you're seeing any other errors, post it here and I'm sure someone can look into it, if not me. Last edited by profcinders : 08/18/18 at 08:04 AM. For me, that fix didn't help. I hope someone takes this add-on up like the author that fixed No Thank You add-on. Yet, am just happy SlippyCheeze fixed Thank You so I can run through not having every book open for me. Yet, it was nice at times to stop and read some of the books saved in Pocket Apocrypha, or the original Librarian.